It is so fun to see that the Evolution design enhance the impression of the cheese decoration and country. 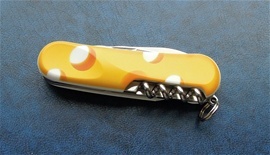 There are four knives in this series from my information with the Cheese, Chocolate, Cow and Postauto decoration. 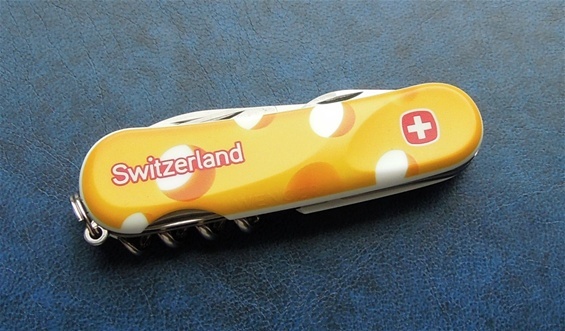 The use of decorations and colors on knife handles gives a nice energy with the Swiss Army Knives and it is a happy impression it gives to me. 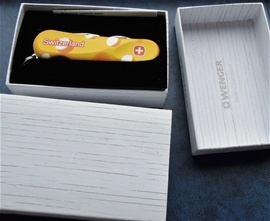 Educational, souvenir, artistic and symbols can be used very well on the knives because the SAKs itself are very much a symbol of Switzerland. Together they are very symbolic but also very useable at the same time. Another impression with this knife is that is follows up on the development with the handle scales and the type or methods used on them. This one is going in the collection. Very happy with this knife!